Torbjørn Rødland, Untitled (Wax IV), 2003–10, black-and-white photograph, 31 1/4 x 25”. For all their restrained, Nordic cool, the photographs of Torbjørn Rødland are uncannily tender and piercingly inscrutable. “A Black Ant Traveling,” the artist’s second solo show with Benevento, comprises a tight group of photographs that alternately parades and conceals the gazes of its subjects. MTV-VJ, 2007–10, and Celtic, 2009, for example, both picture self-possessed young women who assertively direct their confident, even cocky gazes straight into the camera and thus the viewer. 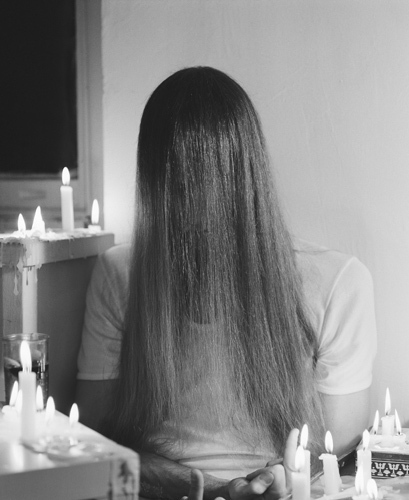 An adjacent triptych, Untitled (Wax I – III), 2003–10, reveals a willowy young man—a figure seated among tiers of lit candles—whose face is completely obscured by long, stringy hair falling over his narrow shoulders and chest; Rødland frames this subject so that subtle corporeal details—his crossed fingertips, the veins in his wrist, a barely perceptible cheekbone—lure the viewer into a kind of anonymous space. These portraits are among the ten black-and-white photographs in the exhibition, which also include images of legs askew and feet slipped into wooden shoes, a shed in a forest clearing, and a tape listing four tracks by the obscure metal band Von. When read together, the grouping seems to hint at a narrative of adolescence and angst, secret hideouts and private spaces. But this story arc at first seems blithe in relation to Rødland’s second series of works: five color photographs that depict human skeletons burning in a funeral pyre. The skulls in each shot, framed by the window of the crematorium, are visible in various states of disintegration. Surprisingly, these candid photographs are ultimately less morbid than their black-and-white counterparts, invoking purification, reverence, and even rebirth. Their inclusion in this show strikes the deliberately tenuous balance that is so characteristic of Rødland’s work.